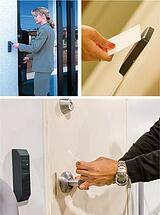 Secure your profits with an efficient access control system designed by Security 101®. Loss of confidential information and valuable assets to burglars can threaten the integrity of your company. Unwanted visitors with intent to harm can endanger your employees and customers. It’s important that your facilities have controlled access to ensure the safety of all.